The Sofitel Marara Beach resort offers a unique, traditional Tahiti vacation with a touch of historical glamor in the air. And it's an affordable Bora Bora hotel! Arriving in the sanctuary of it's lofty, thatched roof, main building, we had a sense of stepping back in time. This wasn't just any homogenous hotel! An exuberant tropical ambiance is enhanced by the use of traditional, natural, island materials such as woven bamboo, wood and stone. 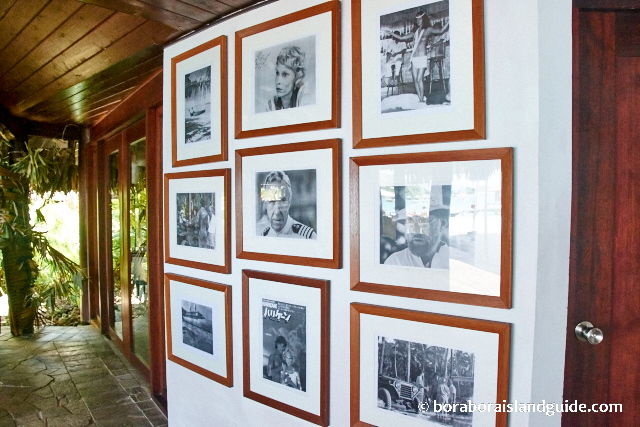 A pictorial wall tells the legendary story of the making of the 1979 movie 'Hurricane'. It was filmed entirely on location in Bora Bora. Did you know that producer, Lawrence De Laurentis commissioned the 40 original garden Bungalows to accommodate the crew of Hurricane? 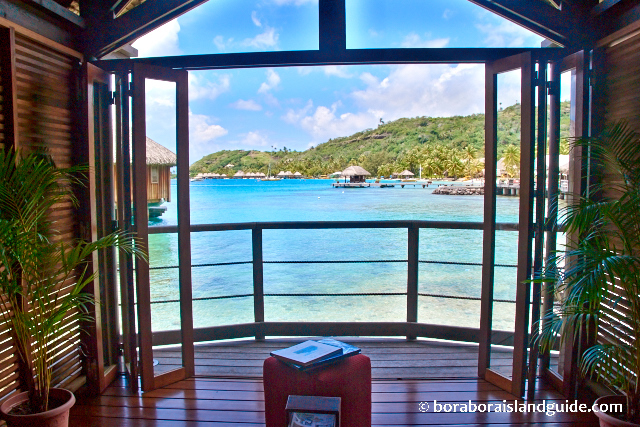 When the movie making finished, De Laurentis's daughter stayed, with the idea of opening a new Bora Bora hotel. 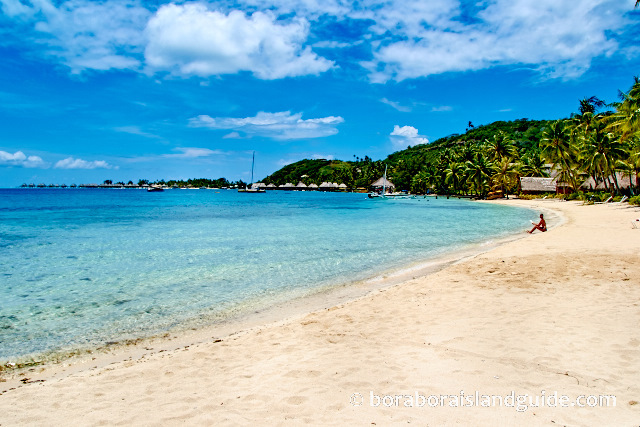 One day she saw flying fish leaping across the lagoon and asked an islander for their name. “Marara” she was told, and thought it an apt name for the resort. As we stepped out into sunshine, the spell was broken and we tumbled back into the present. Where the Sofitel infinity pool meets the world's most beautiful lagoon! On the shore of Marara Beach! 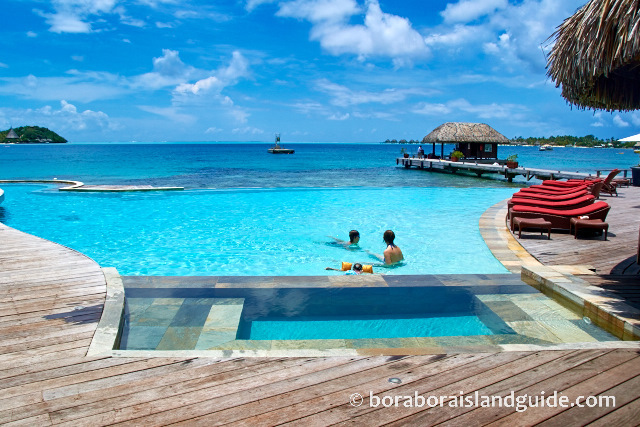 The Bora Bora Sofitel Marara Beach resort provides a cultural immersion. It takes pride in featuring Polynesian traditions. Ensure you don't miss out! See the weekly schedule as soon as you check­in. Each day Polynesian mammas demonstrate their talents for creating shell jewelery, baskets and grass skirts. 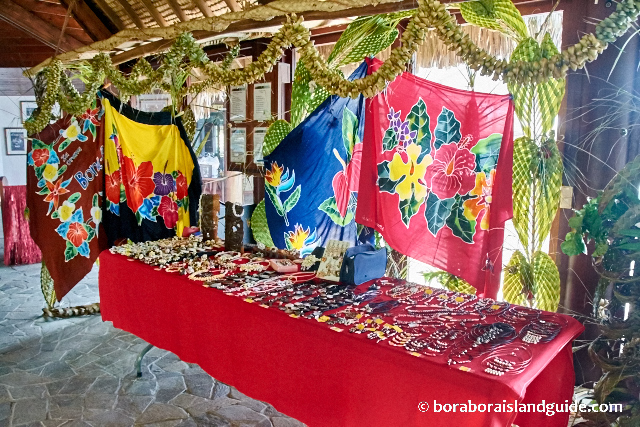 Their beautiful, traditional, Polynesian handicrafts are for sale. The Marara Beach restaurant, Latitude 16°, serves up breakfast, lunch and dinner, in a tropical island ambiance you'll remember long after leaving. 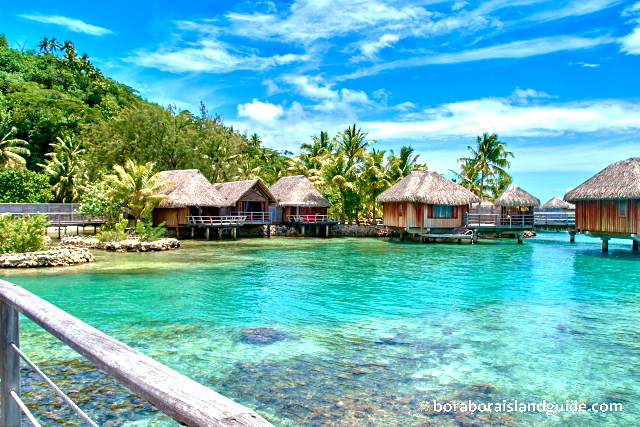 Eating in Bora Bora does cost more than some other island destinations. 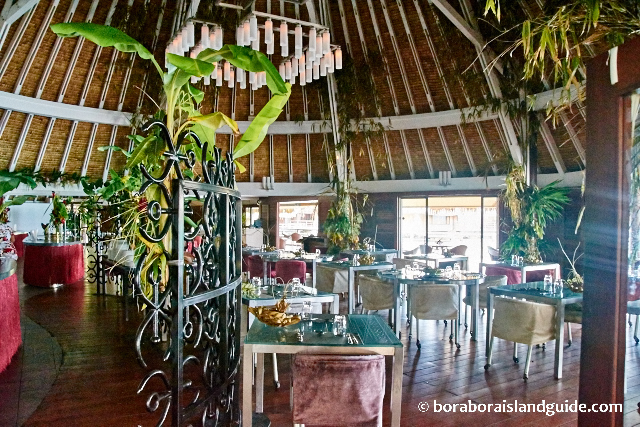 So we discovered a variety of choices for Sofitel Bora Bora dining. The Hurrican Bar is also under a thatched dome. With an awesome view of the infinity pool and across to the Sofitel Private Island and the Pacific Ocean beyond the reef. If you're languishing in the heat, but have already had enough sun, you can sip a fragrant Tahiti cocktail and still enjoy the sublime lagoon. 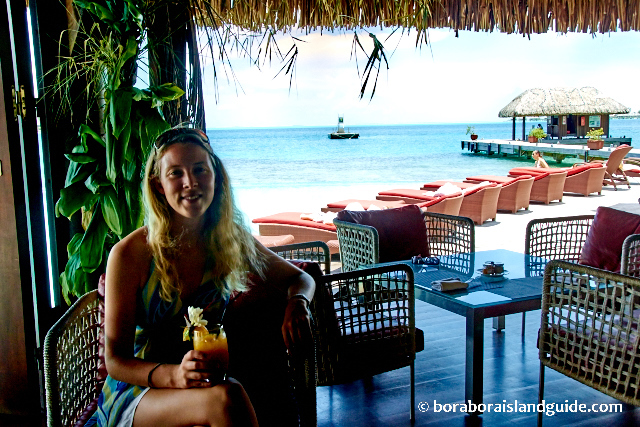 Imagine the movie stars drinking a Maitai here! Watch the acrobatic performances of vacationers parasailing, or zooming past on skis, as they circle the lagoon, enjoying some of the best Bora Bora activities and excursions. The relaxing spa is situated on the Sofitel Marara shoreline, with it's feet in the lagoon. Try a traditional hot stone massage for a new experience. 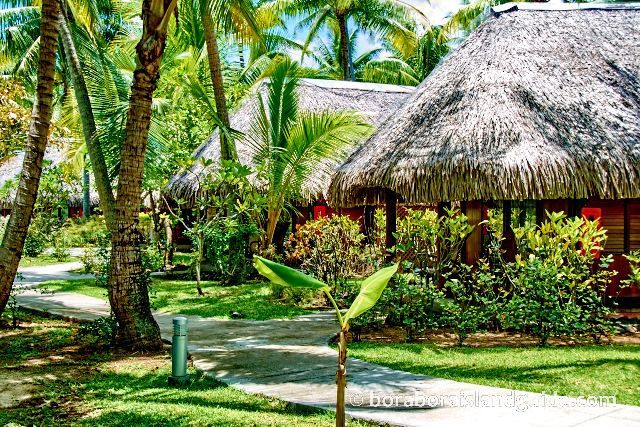 Before you choose your authentic Tahitian hut, make sure you check out the variety of romantic bungalows offered by this distinctly Polynesian, affordable Bora Bora resort. The Sofitel Marara Beach resort on the mainland of Bora Bora Island has 2 bungalows with easy access for anyone with reduced mobility. It will be hard to prise yourself off your sun lounge, with the incredible views at this Bora Bora resort. But some of the Sofitel activities are so special that you will want to get up and have try them. 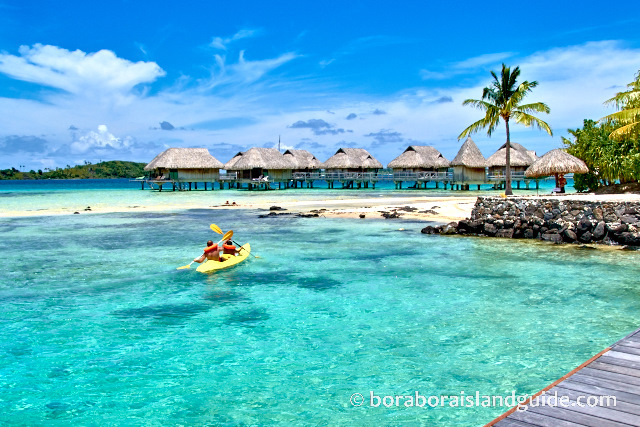 Staying at the Sofitel Marara Beach also entitles you to visit the more exclusive Sofitel Bora Bora Private Island which offers fantastic experiences only available at this Bora Bora resort.